Acne – “One in five adults between the ages of 25 and 44 experiences acne.” says Dr. Friedman. 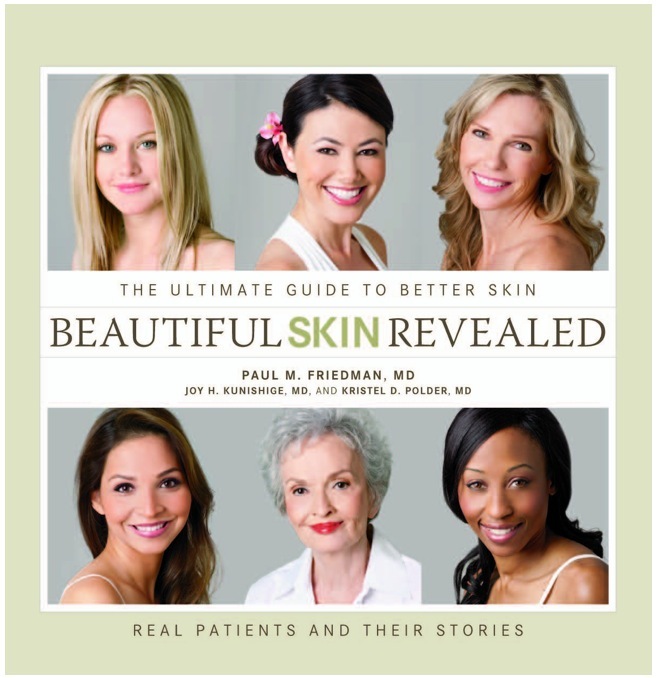 In his book, Dr. Friedman offers solutions for current acne breakouts as well as for scars caused by past acne blemishes. Lasers – “In the past five years lasers have been found in multiple studies to reduce not only acne lesions but also improve acne scars. A great option for patients experiencing both acne lesions and acne scarring is the 1450-nm diode laser by Candela,” he advises. Rosacea – “Notable flushing, diffuse redness, and visible facial blood vessels may point to one of the most under diagnosed, yet prevalent and frustrating skin conditions affecting adults,” Dr. Friedman explains. He notes that although the exact cause of rosacea is unknown, there are several treatment options available. Also covered in Beautiful Skin Revealed, tons of information on how to maintain a solid skincare regimen, including daily sunblock, moisturizer, and topical retinoid use. There’s also information on injectables, Fraxel lasers, Sclerotherapy for leg veins, and much more. The book is available for purchase at amazon.com and barnesandnoble.com in September, but one lucky Hair On The Brain reader will has won a FREE copy of this book! This giveaway is now closed. Thanks to everyone who entered! The lucky number is #4 and the winner is Carol Wong. Hope this book is an interesting and helpful read for you, Carol! For more information on Dr. Friedman, please visit www.friedmanmd.net. I would love a copy of this book. I am in my fifties and am needing some guidance on the best way to take care of my skin. The more one knows about skin the better! Please pick me! I am 28, and 3 months ago my face started going crazy and breaking out. I’m on antibiotics from the dermatologist and this acne shows no signs of subsiding. I would love to read this book and find out some other options that might actually make a difference. I am so self-conscious about this! I need help! I am 64 and never learned about skin care. I would love this book! I’m 25 and I have dry flaky patches on my forehead and oily patches on my cheeks! I need help! I would love to win this book! I’ve been dealing with conditions my whole life that would be greatly benefited by reading Beautiful Skin Revealed. Thanks for hosting this giveaway! I need this book because I always break out and don’t know what’s causing it. I have very problematic skin — I am in my mid-30’s and still have acne and now I am also getting some wrinkles. What I am doing right now for my skin isn’t working — I need help. Thanks for the chance to win this. I have eczema and several other skin conditions, so this would be great. What an interesting book. Lately I noticed a change in my skin (age, hormones?) and have been trying a lot of different products but nothing seems to be working. I’d love to learn more about my skin and how to take care of it. I have problems with cystic acne… and even had to have a cyst removed from my face last year. Any help I can find about this issue would be greatly appreciated! I would like to win this book because my son is only 9 and has started getting bad skin, with a lot of whiteheads. As he is so young, I am reluctant to use too much chemicals on his skin so this book will come in handy. Thanks for the opportunity! I am now 47 and taking care of my skin is very important to me. I need Beautiful Skin Revealed because I want to learn how to make my skin look its best for as long as possible.